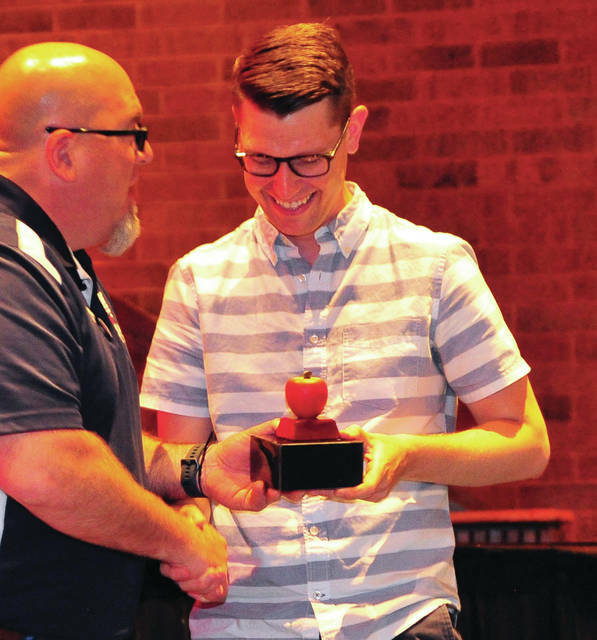 Mike Ullery | Daily Call Piqua City Schools Assistant Superintendent Tony Lyons presents Casey Denlinger with the 2018 Substitute Teacher of the Year Award during Thursday’s Piqua City Schools Staff awards ceremony. PIQUA — Piqua City Schools celebrated the end of the school year on Thursday afternoon by honoring the teachers, support staff, and community members who helped make it a successful year. Dawn Widney, a 1986 Piqua High School graduate, spoke about how the teachers and staff impacted her family. Widney is married to Dane Widney, a 1987 PHS graduate, and their son, Drake, is graduating this year and their daughter, Danielle, will be a junior next year. “You are a wonderful, giving, and amazing group,” Widney said. Widney recognized a variety aspects of Piqua City Schools, from Destination Imagination to the social studies and language arts teachers who inspired her daughter, who recently went on a trip to Europe, to be more interested in the world. She also recognized STEM Day for getting her daughter interested in science as well as the show choir and other staff. Widney also recognized the speech teachers and intervention specialists, and shared her family’s overall “deep gratitude” for the district. “Thank you for standing in the gaps for our students,” Widney said. Thompson then went on to recognize the efforts of staff members who responded over the weekend when a Northwestern student passed out during a track meet at Alexander Stadium on Saturday. Thompson recognized those individuals who helped during that emergency, including Courtney Downs, Chip Hare, Scott Kaye, Erin Schmerge, and Katie Smith. “They revived the student and saved his life,” Thompson said. Next, Thompson awarded the Friend of the Schools to the Garden Tribe, a group of community volunteers — including Ruth Koon of the Friends of the Piqua Parks and Anna Baumeister from the Piqua Area Chamber of Commerce, who first introduced the project — who helped implement and work on the schoolyard garden across from Piqua Central Intermediate School. For the Golden Apple Award, PCS honored substitute teacher Casey Denlinger. Thompson said Denlinger stood out among over a dozen other nominees and was described as being a “team player” who connected with students and staff. “He always had a smile on his face,” Thompson said. Thompson then honored the support staff members of the year, including Sarah Patrizio at Piqua Junior High School, Robin Phipps at PCIS, Keri Scott at Springcreek Primary, April Vosler at Washington Primary, and Susan DeBrosse at the district’s central office. The Support Staff Employee of the Year for both the district and PHS was Beth Rosenkranz. Thompson also honored outstanding educators, including Debbie Allen at PHS, Jared Askins at PJHS, George Crickmore at Springcreek, and Holly Peeples at Washington. The Teacher of the Year was Stacy Patton at PCIS. Several retirees were honored at the celebration, including Rick “Clap” Claprood, with 14 years of service for the district; Susan DeBrosse, with 25 years of service; Linda DeWeese, with 22 years of service; Charles “Chuck” Flaharty, with 34 years of service; Brenda M. Galley, with 33 years of service, Becky Jenkins, with 33 years of service; Cheryl Jones, with 25 years of service; Adele Penrod, with 18 years of service; and Connie L. Strehle, Ph.D., with four years of service. “I can’t say enough how proud I am of everything you’ve accomplished,” Thompson said. https://www.dailycall.com/wp-content/uploads/sites/30/2018/05/web1_053118mju_pcs_staffawards.jpgMike Ullery | Daily Call Piqua City Schools Assistant Superintendent Tony Lyons presents Casey Denlinger with the 2018 Substitute Teacher of the Year Award during Thursday’s Piqua City Schools Staff awards ceremony.